Jimmy Choo Flash London Club embodies the spirit & atmosphere of nightclubs. Jimmy Choo Flash London Club 100ml. Eau De Parfum for women and embodies the spirit and atmosphere of the entertainment nightclubs of London, which is considered one of the centers of modern electronic music. The founder of the new fragrance has become a perfumer Christine Nagel. Flash London Club is a fruity floral cocktail with soft musk base. Perfume is a reflection of a musical composition: it starts with bright, fresh and sparkling fruit and citrus notes, which move in rhythmic chords of white flowers, among which are the notes of tuberose, and gradually completed, moving in soft shades of wood, musk. Perfume has a moderate sound, basic his notes are tuberose and white flowers, which adds an aura of moderation wood-musk and citrus notes. 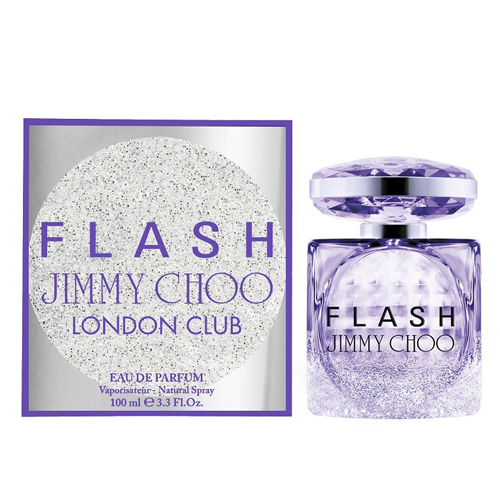 Fragrant composition of perfume Jimmy Choo Flash London Club consists of flower-fruit notes. It begins with fresh and sparkling notes of bergamot, lychee, picks up the sound of the notes of tuberose fades into the final chord with woody musk. it's a great perfume composition appeared on the international market of cosmetics and perfumes in the year 2014-. The charming bouquet for sophisticated, luxurious and delightful girls and women is a member of the family flower fruit with musky temperamental chords. Perfume for women belongs to the family of floral fruit with musky chords. The author of the composition became perfumer Christine Nagel. Bright, explosive and dynamic fragrance is dedicated to the night clubs of London and reflects the vibrant nightlife of its inhabitants. Perfume is fully revealed after sunset and gives its owner an extraordinary appeal and confidence. Similar in flavor versatility and elegance - Velvet Sugar from renowned Bath and Body Works. Jimmy Choo Flash London Club - is the composition of the notes of bergamot and lychee, surrounded by shades of tuberose, musk and light wood.